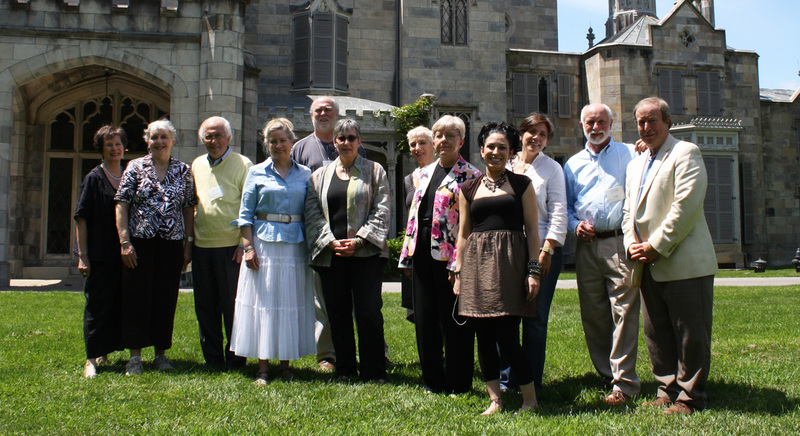 All good things must come to an end, and so Saturday, January 7, 2012 will mark the official conclusion of the Hudson Valley Art & Wine celebration, our program that paired 18 juried artists with 11 local wineries over the course of the past year-and-a-half. We’re proud to say the resulting traveling exhibit of 35 original works was a “first” for the Hudson Valley, and one that won’t be soon forgotten. For those who haven’t been following, here’s a brief recap . . . back in May of 2010 we began our jury selection of artists, who we then teamed up with a winery where each artist was “inspired” to create their work. In December 2010 we celebrated with a sneak peek of the artists preliminary sketches at an event at Locust Grove Historic Site, where we sampled the wineries’ latest releases. Final pieces of art were completed in May 2011, and the exhibition premiered with much fanfare at a Grand Celebration event at the Lyndhurst National Historic site. The program – and the exhibition – gained momentum in the months following the premier, and word of it made its way from county to county, opening up a new dialogue in each community. One reflected on “art” and “artisanal” – both having deep-rooted meanings here in the Hudson Valley. (After all, we not only have the distinction of being the birthplace of America’s first Art Movement, but also America’s oldest winery.) 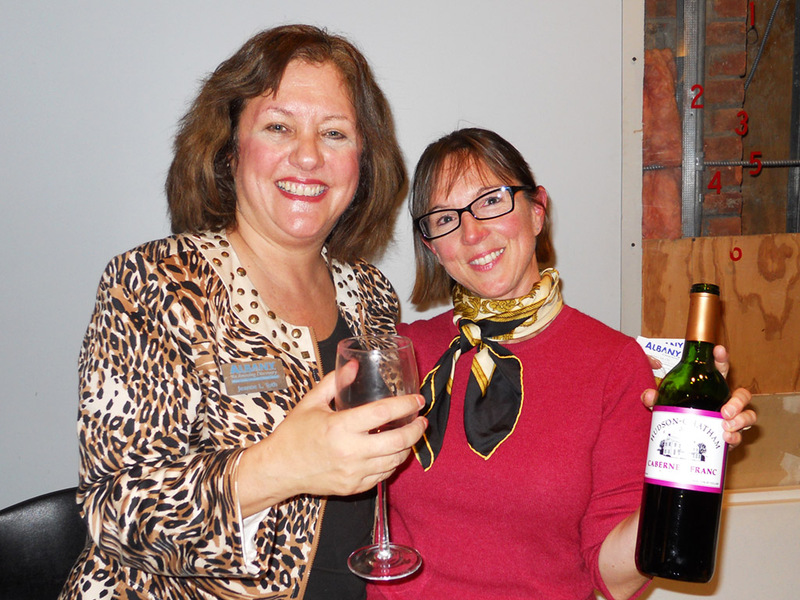 The program fostered a renewed appreciation of local artists and local winemakers, and celebrated the multitude of talents that this region inspires. So the time has come to once again thank all of you who came out to view the exhibition as it made its way through the region – from Locust Grove to Lyndhurst, followed by the other gallery openings in Catskill, Cornwall and Albany through to today. We’d also like to extend a special thanks to our sponsors and all those who have lent their support over this program’s long course. We have enjoyed working closely with all of the artists and winemakers, and we have enjoyed sharing a glass of handcrafted wine with many of you at the exhibit openings. Hudson Valley Art & Wine may be concluding, but the discussion about art and wine here in the Hudson Valley is just beginning. Let’s keep it going! A gift-wrapped piece of Hudson Valley vineyard-inspired art is the perfect holiday gift for that special vinophile in your life. 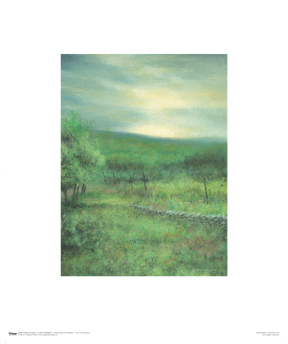 Numbered, signed prints by renowned Hudson Valley artists Patrick Milbourn and Paul Gould are sure to please. Only 100 of these beautiful prints were signed by each artist. The prints measure 20” x 24” and are available framed – just add a red ribbon and they’re ready to give! To order, please contact us at artandwine@hvwinemag.com and we’ll arrange delivery (or pick-up) in time for the holidays. Framed prints are $125, unframed prints are $80, plus shipping. Art collectors may prefer an original work from the exhibit. Many of these pieces are still available for sale, currently showing at the Albany County Convention and Visitor’s Center through December 31. And what a provenance these artworks already have, with showings in 4 galleries this year! and Togut’s “Crystalline Winter Rest”, or a wide variety of paintings including Chermayeff’s “Fall Color in the Baco Noir,” Laurenzi’s “Spirited Tasting at Warwick Valley,” and Horton’s “View from Applewood.” Or you may prefer a unique medium such as Turan’s work in fiber, “Millbrook – Picnic Tables,” Bari’s porcelain “Evolutionary Path” or one of a number of photographic pieces. 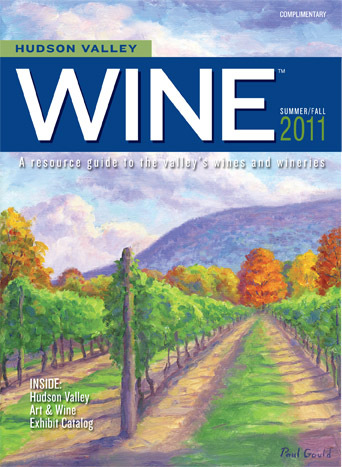 The complete catalog from the exhibit can be viewed on our website at www.hvwinemag.com. The year-long celebration of Hudson Valley Art & Wine may be coming to a close, but that doesn’t mean you can’t take home a piece of the exhibit to enjoy for years to come. 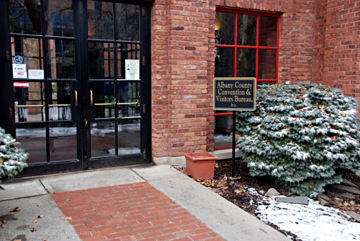 Don’t forget to take a break from your holiday shopping and visit the gallery at 25 Quackenbush Square, Albany. The setting: a beautiful fall evening in early October at historic Quackenbush Square in Albany. The event: a celebration of the final opening of the Hudson Valley Art & Wine travelling exhibit, hosted by the Albany County Convention & Visitors Center. The evening began as each guest was greeted at the door with a souvenir glass of chilled Millbrook Vineyards Tocai Fruilano. Over 120 guests – members of ACCVB, press, representatives from the State Government and local artist associations – milled around with glass in hand, taking time to relish the artwork that was created by local artists in the Hudson Valley vineyards. Several of the artists were on hand to offer their insight, including Judy Reynolds who created beautiful pastel pieces at nearby Brookview Station Winery, K. Velis Turin whose fiber sculptures were inspired by Millbrook Vineyard’s lush landscapes, Vince Natale who focused on Whitecliff Vineyard’s winemaking tools to create a realistic still-life, and Crista Pisano whose detailed, yet tiny works captured the essence of Applewood Winery. 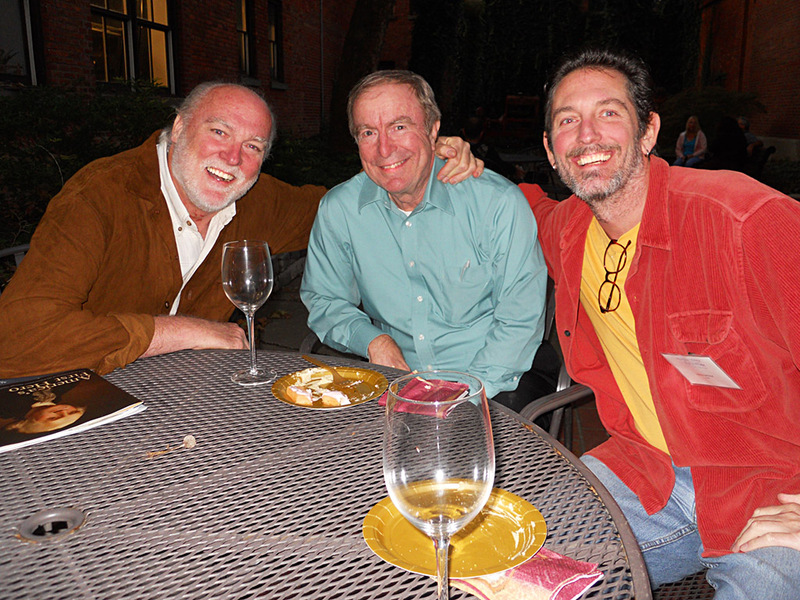 Virginia Donovan and Patrick Milbourn who both painted at Glorie Farm Winery, and Paul Gould – whose painting from Palaia Vineyards made our issue’s cover – also reveled in the evening’s festivities. 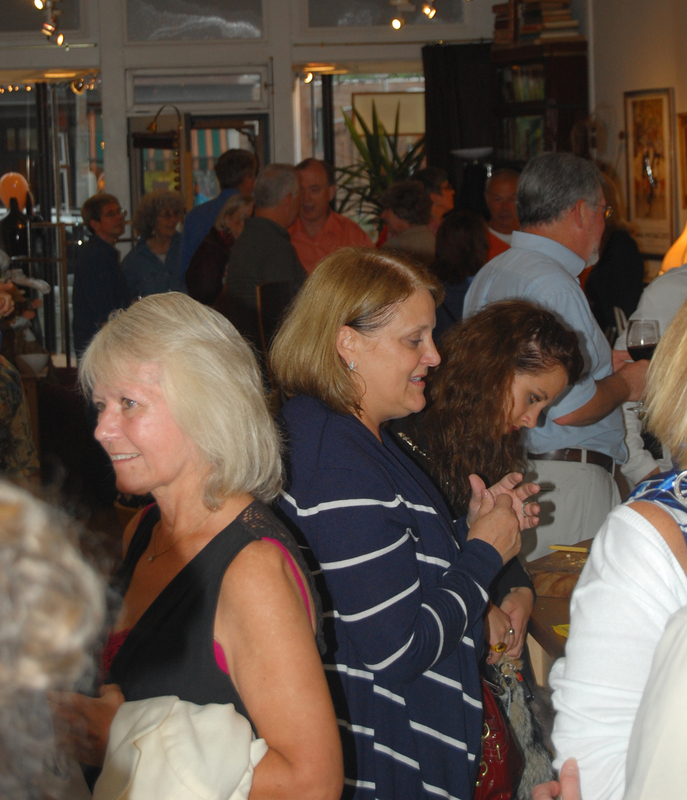 The turnout was great and the atmosphere was relaxed as both artists and guests lingered in the gallery and courtyard and even explored the museum, savoring the plentiful wines poured by Hudson-Chatham and Brookview Station wineries. There was a wonderful spread of catered foods to compliment the wines. The Art & Wine exhibit, curated by Hudson Valley Wine Magazine premiered in Westchester this past May, and has been making its way through the Hudson Valley ever since. It showcased in Cornwall and Catskill over the summer, each with its own opening celebration, and featuring wines local to each gallery. The exhibit will be on display at the Albany Heritage Center through December 31, so be sure not to miss the final stop of Hudson Valley Art & Wine! The hot-off-the-press fall issue of Hudson Valley Wine magazine features Part II of the exhibit catalog from the Hudson Valley Art & Wine pairing project. This weekend, September 10th and 11th, you can pick up your free copy at the Hudson Valley Wine & Food Fest in Rhinebeck, NY. The 10th annual event will once again take place at the Dutchess County Fairgrounds, and Hudson Valley Wine Magazine, a sponsor of the event will be at Booth 46 in Building B with plenty of magazines on hand. This exhibit catalog is the companion piece to the one published in the spring/summer issue and together they are a comprehensive guide to the full exhibition, the artists and their paired wineries. The special 12-page color insert highlights one entry by each of the twelve artists in the program. If you missed Part I of the exhibit catalog, we’ll also have back issues available until supplies run out. Limited edition signed prints of the artwork by Paul Gould and Patrick Milbourn will be on sale at our booth too – these make great gifts for wine and art lovers. Stop by and meet us in Building B! 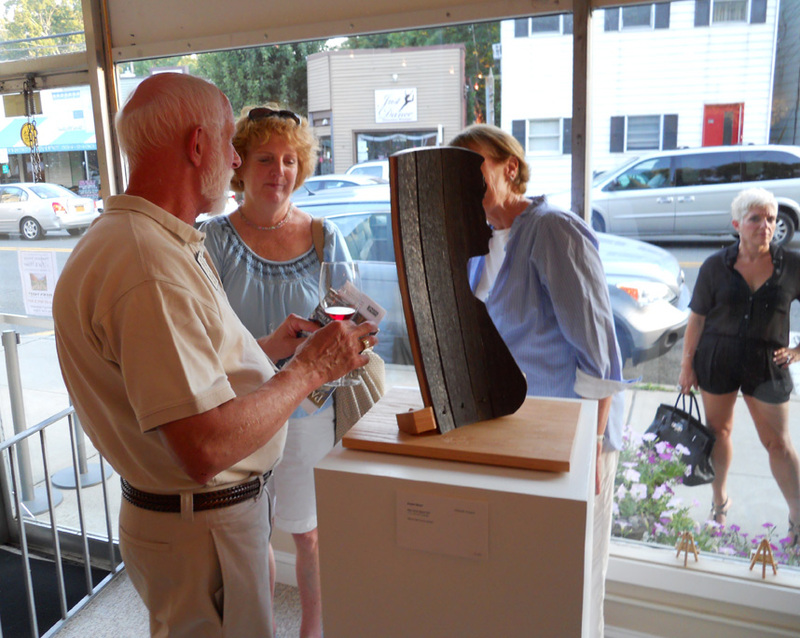 Labor Day weekend marks the close of the Hudson Valley Art & Wine exhibit at Hudson Valley Gallery in Cornwall-on-Hudson. Be sure to stop in and visit artist Paul Gould, whose dynamic oil painting “Autumn’s Bountiful Blend” graces the cover of the Fall issue of Hudson Valley Wine Magazine. 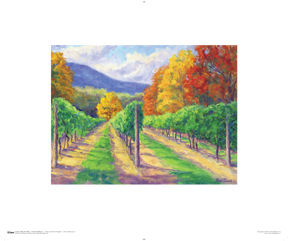 Paul was “paired” with Palaia Vineyards for the art and wine pairing project and he masterfully captured the essence of the vineyard during its most colorful season. 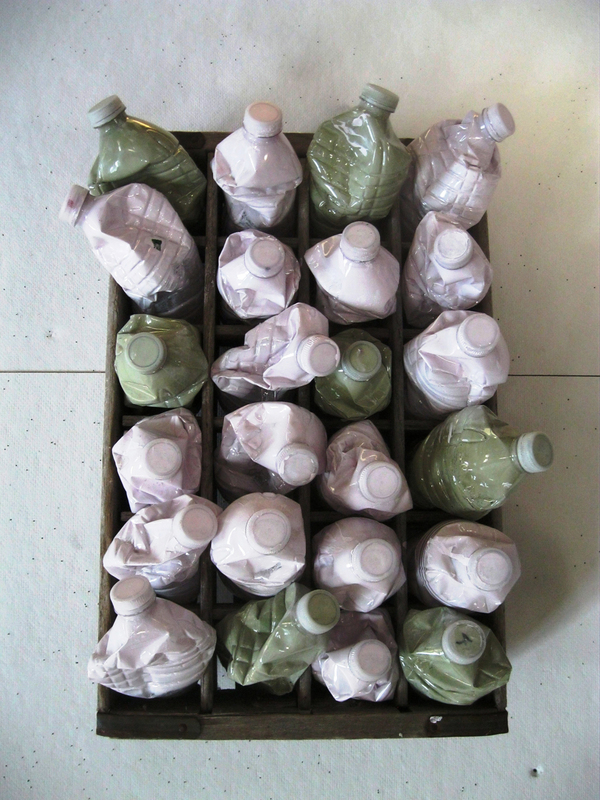 Eighteen artist’s works are currently on view at the gallery. These beautiful interpretations of the wineries and vineyards include pastel landscapes, unique mixed media sculptures, photography and even pieces incorporating actual wine barrel staves. This is a great opportunity to bring home a piece of your favorite Hudson Valley vineyard, and framed prints by Paul Gould and Patrick Milbourn are also available. 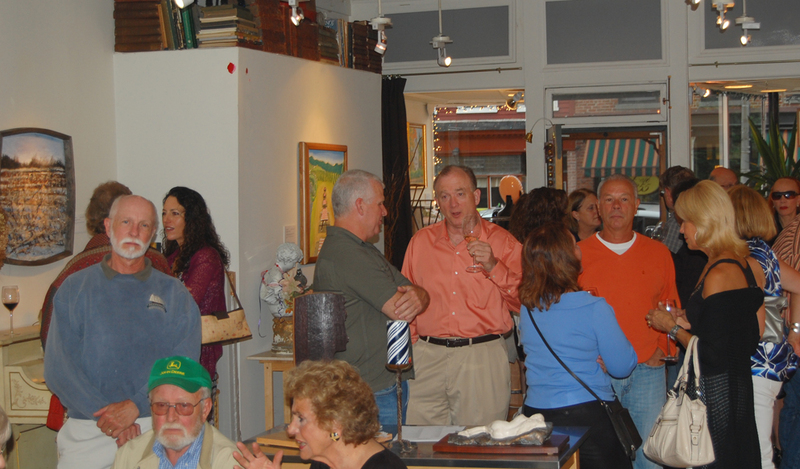 Hudson Valley Gallery is located at 246 Hudson St., Cornwall-on-Hudson. For hours visit www.hudsonvalleygallery.com or call (845) 401-5443. Don’t miss the exhibit before it makes its way up to Albany! Hundreds of art and wine aficionados flocked to the little riverfront village of Cornwall-on-Hudson on Saturday for the Orange County debut of Hudson Valley Art & Wine. Guests enjoyed meeting many of the artists who participated in Hudson Valley Wine Magazine’s “pairing project” and were intrigued by their interpretations of the twelve Hudson Valley wineries. 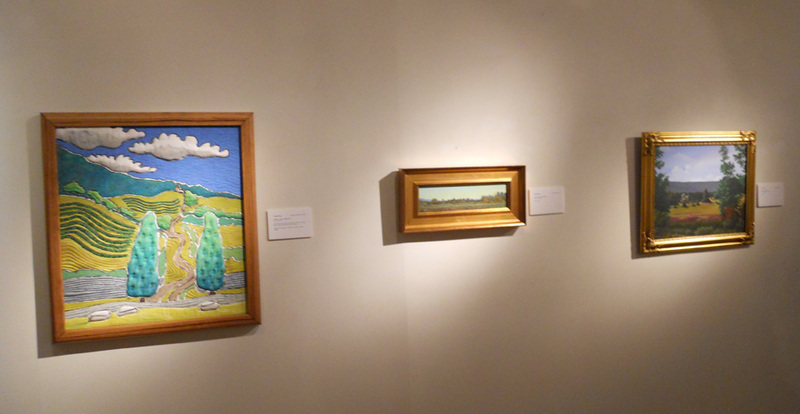 Paul Gould’s freshly revamped Hudson Valley Gallery was the perfect backdrop to display the exhibit’s over 35 works of art, including 3-dimensional pieces by Robert Breuer, lush landscapes by Virginia Donovan, Jan Horton and Judy Reynolds, and John Natale’s bright acrylics. Guests cooled off from the summer heat with chilled white wines from nearby Warwick Valley Winery, Brotherhood Winery and Palaia Vineyards. The most popular cocktail of the evening was a Kir that combined two of the winery’s selections – Brotherhood’s Blanc de Blanc with Warwick Valley Winery’s Black Currant Cordial. 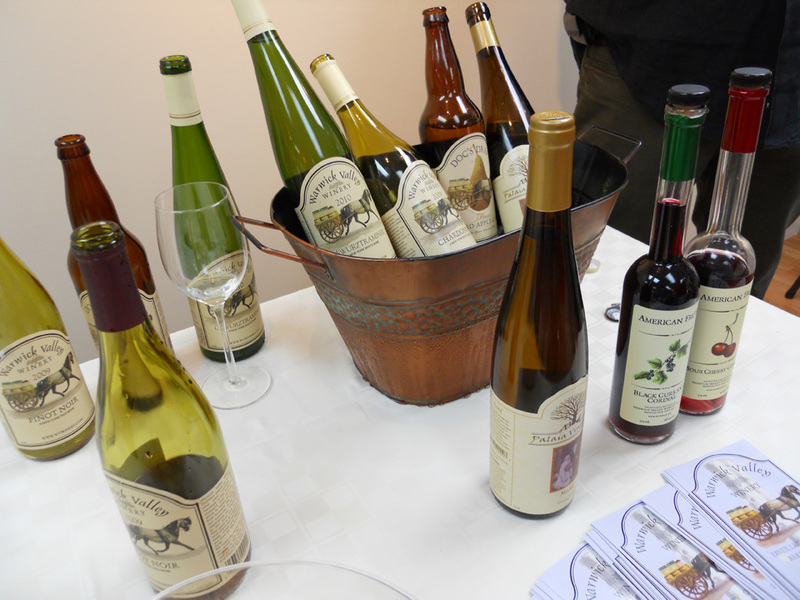 The wines were paired with a wonderful assortment of small bites from Hudson Street Café, and music by harpist Jim Davis flowed throughout the gallery. 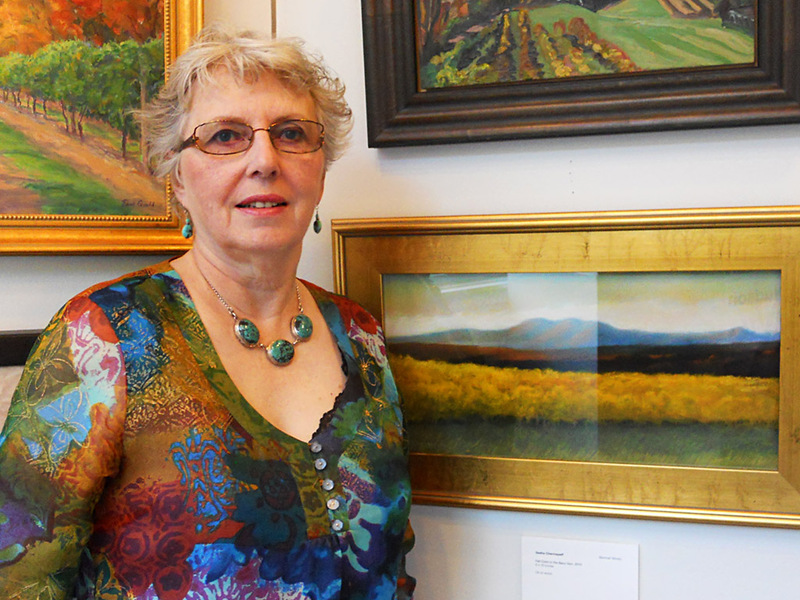 Artist Crista Pisano unveiled a new addition to the exhibit, a petite oil painting entitled “Applewood, Fall Trees and Grapes,” her third work in the series from Applewood Winery to replace her piece sold at the previous show. Congratulations Crista! The Art & Wine exhibit continues through Labor Day so stop by and be inspired! Hudson Valley Gallery is at 246 Hudson St., Cornwall-on-Hudson. 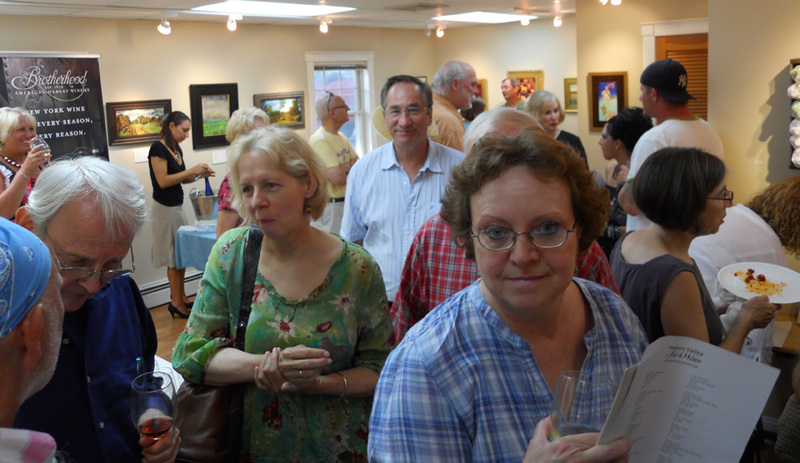 The opening celebration at Hudson Valley Gallery in Cornwall-on-Hudson is right around the corner! This is the third stop for our Hudson Valley Art & Wine exhibit, so be sure to save the date – Saturday, July 23 – from 5 to 8 pm. 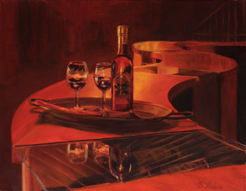 The evening will feature live harp music, refreshments and wine tastings by some of the wineries that inspired the artist’s works. Come and see Barbara Rubin’s pieces inspired by Brotherhood, America’s Oldest Winery and sample their wines. The gallery’s owner, landscape painter Paul Gould, took his inspiration from Palaia Vineyards, just a few minutes away from the gallery. Wines from Palaia will be sampling as well. Meet other artists from the area who captured the beauty and spirit of the Orange County wineries – Jan Horton and Crista Pisano who painted at Applewood Winery, and John Laurenzi who painted at Warwick Valley Winery. Of course, the entire exhibit of paintings, pastels, photographs and sculptures will be on display and many of the artists will be on hand to discuss their work at the wineries. Many pieces are available for sale. Join us for a spectacular evening in Cornwall and receive a complimentary crystal wine glass and gift bag too. Plan to spend some extra time – the opening celebration will conclude with a finale of fireworks compliments of the nearby Annual Fireman’s Fair! Paul Gould’s Hudson Valley Gallery is located at 246 Hudson Street right on the Hudson River. The exhibit will run through September 5. 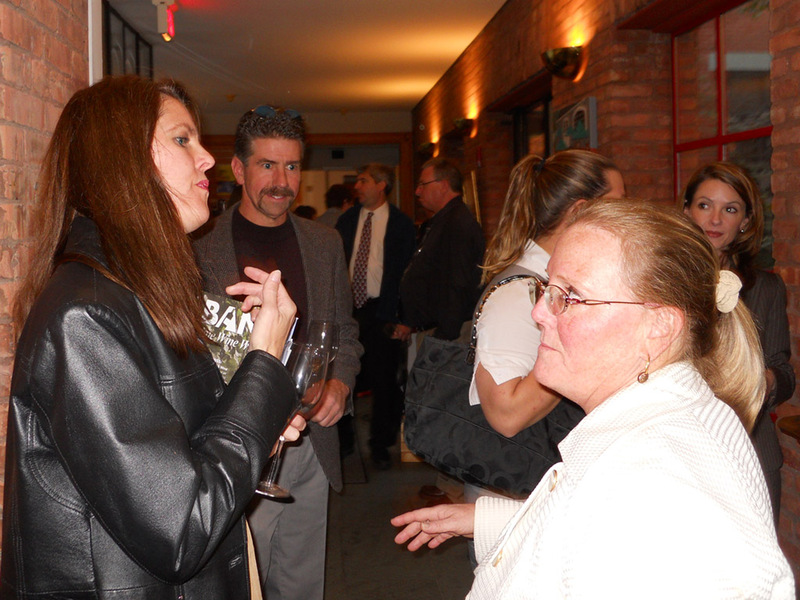 M Gallery in Catskill was all abuzz last weekend with the opening of the Hudson Valley Art & Wine traveling exhibit of winery-inspired art by 18 Hudson Valley artists. Over 300 attendees visited the gallery to view the art and sample wines from Hudson-Chatham, Palaia and Millbrook Vineyards. Historic Catskill, birthplace of the Hudson River School of Art is currently home to many artists and art aficionados who showed their enthusiasm for the unique exhibit during the four hour event at the gallery. The exhibit and sale runs through July 9. If you haven’t seen the exhibit be sure to stop by M Gallery or save the date for the next gallery opening – Hudson Valley Gallery in Cornwall on July 23.
original piece of art from the exhibit, please contact us for the price list. If you didn’t get to the kick-off celebration at Lyndhurst last month, you can still view the exhibit and enjoy select Hudson Valley wines from the wineries that inspired the art. Join us at M Gallery, 350 Main Street, in Catskill on June 11. Preview from 4–6pm; Artists reception from 6–8pm. View vineyard landscapes in oils, acrylics and pastels, photo prints and giclées, three- dimensional pieces and even sculpture using recycled water bottles – all inspired by the Hudson Valley vineyards. Complimentary crystal wine glass and gift bags for all attendees. Stop by for a quick preview and wine tasting, or linger for hours and meet the artists in the historic town of Catskill, best known as the birthplace of American art.